When Osensei (Grandmaster) Shoshin Nagamine (1907-1997) opened his first Dojo in 1947 he named it the ‘Matsubayashi-ryu Kodokan Karate And Kobujutsu Dojo’, and it was at this moment that Matsubayashi-ryu was born. Based on the teachings of some of Karate’s legendary masters, including Arakaki, Kyan and Motobu (whom Grandmaster Nagamine cites as his three primary teachers), Matsubayashi-ryu though young in name, is ancient in origin, with its roots going back centuries through the history of Shorin-ryu and its constituent ‘styles’ of Shuri-te and Tomari-te. According to Grandmaster Nagamine in his book, ‘The Essence Of Okinawan Karate’, Matsubayashi-ryu – meaning the Pine Forest School/Style – was named in honour of Grandmaster Nagamine’s teachers – Kosaku Matsumora (teacher of Choki Motobu) and Sokon Matsumura (teacher of Chotoku Kyan). Matsubayashi-ryu can also be pronounced Shorin-ryu; both are correct pronunciations, though when differentiation is needed between Grandmaster Nagamine’s teachings and that of another Shorin style, it is better to pronounce it Matsubayashi-ryu. This short piece is, however, merely an introduction, and for a clearer understanding of the history, and teachings of Grandmaster Shoshin Nagamine, let us read his own words on the matter. On 15 July 1907, I was born in Tomari-son, Naha City, of my father, Shoho and my mother Gozei. Though my physique was rather small, I was active and aggressive as any other healthy boys in my preschool days. Completing the compulsory education of primary school in March 1923, I entered Naha City-run 5-year Commercial School. However, when I was second-year student of the school, I suffered from a gastroenteric disorder and given a medication for some time. But, because of inefficacy of the medication, I had to resort to a diet, while practising Karate at the backyard of neighbour friend, Mr. Chojin Kuba. It was in 1926 and I was 17 years of age. After graduation in March, 1928, I started a full-scale practice, becoming the disciple of Mr. Taro Shimabokuro of Shuri City, who was senior of me by one year. It was my daily task to cover 8 km road between Shuri and Naha on foot to master the art of Karate. Thanks to the warm-hearted encouragement of brother Taro, a hope was aroused in me, was enamoured with the charm of martial art, and thus my appetite for Karate surpassed that of eating. Under the guidance of another Sensei, Ankichi Arakaki, I made further progress in the skills of Karate. Recovery of health was complete then, I was 162 cm tall with marvellously developed physique. In 1928, I was examined for conscription, and passed it as class 'A' infantryman, and assigned to the 47th Infantry Division stationed in Oita Prefecture, Japan. In April of the same year, I was dispatched to skirmishes in Sainan, China, and in July next year, returned to Okinawa after an honourable discharge from the military service. Thinking about my future profession in which I may be able to utilize the skills of Karate, I decided it was policeman. And, in 1931, I was appointed a policeman of Okinawa Prefecture. The notion that I should scientifically study Okinawa Karate which, had never been systematically analysed in the past, and the wishes for cultivating and training of body and mind could never get out of my mind. On the recommendation of Sensei Chojun Miyagi, founder of a different school called Goju-ryu, I was given a title of Renshi in May 1940, from the Great Japan Botoku (Respect for the martial arts) Association at the Butoku Festival held in Kyoto, Japan. Realizing the existence of common essence between Kendo and Karate, I began practising Kendo in 1938. After assiduous efforts made for some time, I was awarded a Sandan in Kendo in 1941, and had an opportunity to participate in the policemen's martial arts contest among Kyukyu, Yamaguchi and Okinawa blocs which took place in Nagasaki Prefecture. In December 1941, I was dispatched, as a trainee, to Police University in Tokyo and, while I was there, given a chance to demonstrate the police-Karateman's mysteries of Karate before a large audience of policemen of the Metropolitan Police Special Guard Division. While engaged in the transportation of casualties in Iraha village with other POWs, I happened to find on the road a book entitled "Introduction to Karate" by Sensei Ginchin Funakoshi, by which I determined to lead a life of Karateman and find a hope to struggle against adversities. July 6, the same year, we the POWs were transferred from Iraha to Kocha, Ginoza village for the cultivation of the farm, while leading a life of refugees. In July 1947, I was allocated a standardized house in Makishi ward, Naha City, and after settling down for a while, a temporary dojo was opened with the addition of wings to housing. The dojo was named Matsubayashi-ryu Kodokan Karate and Ancient Martial Arts Study, where I began practising and teaching Karate to youngsters. During the war, Okinawa was a scene of carnage between the U.S. and Japanese forces, eradicating distinctive culture, greenery of landscape, kind and admirable characteristics of people, and an often referred to as 'the Land of Courtesy' became the thing of the past. Young people lost their spiritual guidance and fell into decadence; public morals corrupt, moral decline caused an increase in the number of serious crimes. A matter requiring immediate attention in such a situation was to implant in the minds of youngsters an indomitable spirit. Though I felt keenly the necessity of building an independent dojo where I may be able to mingle with the young, practising together and sweating together, but its realization was a remote possibility where there was nothing but everything was reduced to ashes. Nonetheless, our team won the victory, beating all the 13 participating stations. It was really a fruitful effort after so much workouts and training. Our hard was finally paid off when all the members of our team, including me, were promoted to black belts. When I decided to quit after serving as superintendent for a year, however, fellow policemen begged me to stay in my position. But, my strong determination to follow a Karateman's life tore myself from my policemen-friends with a bleeding heart. In January 1953, I managed to build a long-cherished and full-scale Karate dojo for the first time in Naha and restarted, hanging a shingle as "Matsubayashi-ryu Karate Kodokan". In the following December, I ran for election to the Naha City municipal assemblymen and served for three terms and recommended for vice chairman. I resigned the post in 1957. After that I had my dark days following the failure in business twice, but even at the nadir of my fortune, continued the practice of Karate. From time to time, I had vague feeling of anxiety in tackling with Karate and my way of living. Just then, I had a chance to read Book of Five Wheels written by Miyamoto Musashi, in 1963, and was much moved. Already I had read through a book titled "Teshhukoji-no-shinmenboku" (Buddhist layman and master swordsman, Teshhu's true self). Luckily I was given a hint in going ahead of my way as a Karateman through the reading. The two were unrivalled swordsmen in all ages, had common in intelligence, bravery and physical power, embraced the Buddhist faith so as to have an unbending spirit, practised Zen meditation for art of war, and devoted whole heart to the spiritual problems. These pioneers of martial arts opened my eyes to re-orient my physically bent Karate to the togetherness of Fists and Zen. So I was resolved to adopt Zen meditation as part of Karate practice ever since. As famous Zen Buddhist Dogen once said, "Accomplish what you cherish in your mind", I became, by a happy chance, disciple of Zen priest, Sogen Sakiyama of Enkakuji in October and began Zen meditation course within the dojo. As the priest went to the U.S. for preaching, I begged teachings from Keisho Okamoto, another priest of Rengein of Itoman, and furthermore from Shuzen Kise, priest of Jushoin of Chatan for Zen practice. Upon the death of Grandmaster Shoshin Nagamine, the supreme authority of Matsubayashi-ryu passed to his son, Soke Takayoshi Nagamine. Soke Nagamine taught at the Kodokan Nagamine Dojo in Naha, Okinawa and oversaw the development of Matsubayashi-ryu through the World Matsubayashi-ryu Karate Association (WMKA) and the regional member organisation European Matsubayashi-ryu Karate Association (EMKA). Soke Nagamine visited Europe many times, teaching seminars in countries such as Norway, Germany, France and Ireland, and the numbers of practitioners are growing all the time. Soke Nagamine, as his father, held it the responsibility of every teacher of Matsubayashi-ryu to retain the original form of every Kata (18 in total) and Kumite Kata (7 in total) as handed down to us from Grandmaster Nagamine. In this way, we are keeping alive the tradition founded by Grandmaster Nagamine. 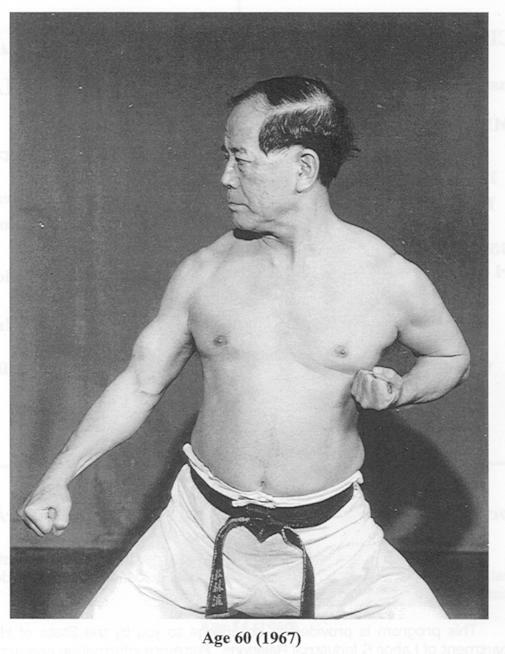 Though the Kata remain the same, Soke Nagamine also encouraged personal investigation into the meaning of the movements, the development of personal knowledge and skill through the exploration of all possible meanings of the techniques contained within the Kata. Though the outside form doesn’t change the meanings are limitless. Upon the death of Soke Takayoshi Nagamine on April 25 2012, the supreme authority of Matsubayashi-ryu passed to the newly elected President Yoshitaka Taira (Hanshi 10th Dan). A big Thank You to Martin O'Malley for this text!